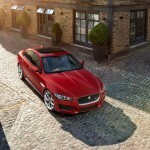 Jaguar unveiled the new midsize sedan named XE at Earls Court, London. 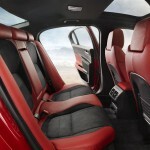 The car will go on sale in 2015 in Europe and in 2016 in the USA. 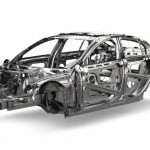 Five years after ceasing the production of the unsuccessful X-Type, based on Ford Mondeo platform, Jaguar brings a successor which is the first model in the brand to use the new modular vehicle architecture of Jaguar Land Rover. 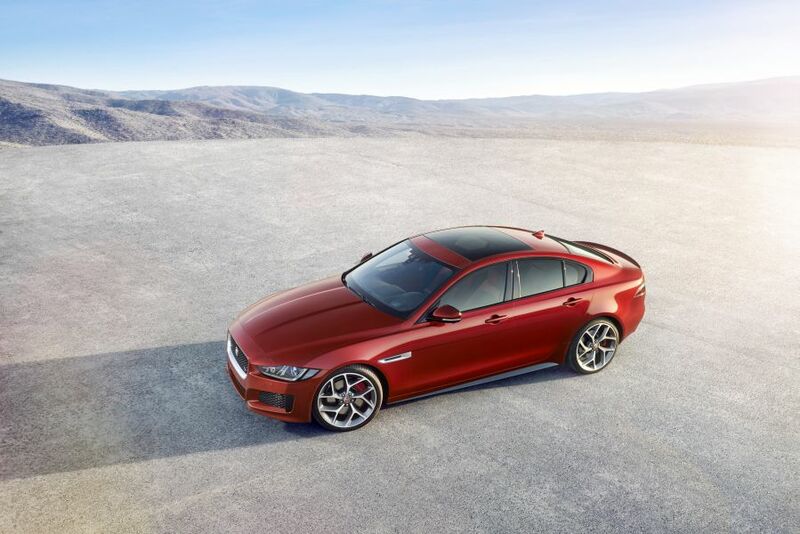 In these pictures you can see the XE in S version with the supercharged 3.0 litre V6 at 90 degrees (wide angle offers space for the twin vortex Roots supercharger) which generates 340 Nm and 450 Nm of torque. 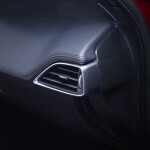 The S model features large front intakes, chrome side vents inspired by Jaguar F-Type, while the shape of the headlamps and the J-shape of LED daylights remind us from Jaguar XJ. 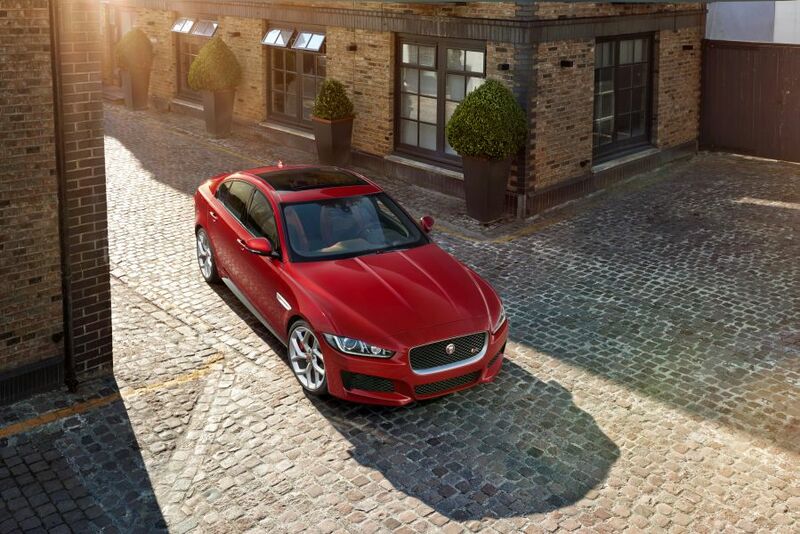 The strong sculpted bonnet creates a muscular appearance and the sloping and sleek line of the roof contributes to reach the best Cx for a Jaguar with only 0.26. 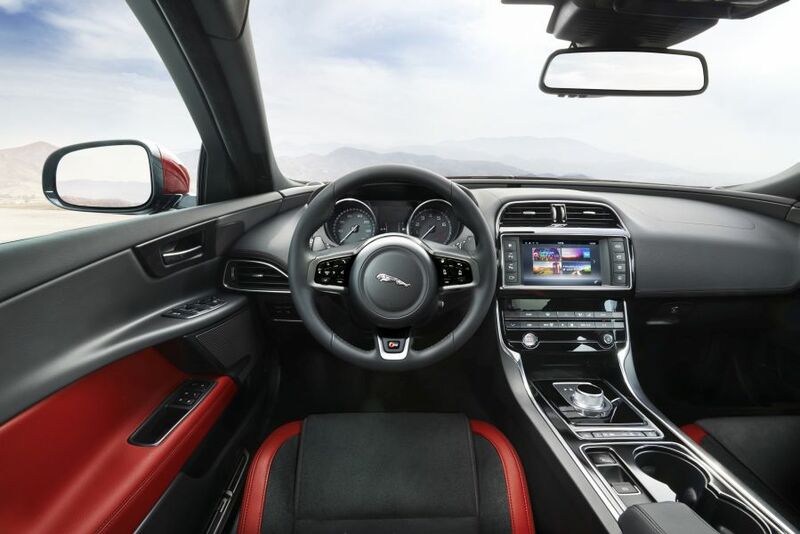 Inside, F-Type style dials and the cluster needle which sweep on start-up emphasizes the XE sport character. The switches and controls and even the type of the letters from the switches remind us of … BMW meanwhile the in-dash mounted display looks a little old fashion if we compare it to the new free standing display in C-Class. 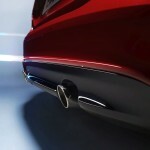 But the main achievement is the intensive use of aluminium for the body. 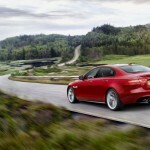 Press kit explain that “XE is the only car in the class to use an aluminium-intensive monocoque” but does not mention the percentage of aluminium (the new C-Class hybrid body has 48% aluminium).The doors, bonnet, roof and front and rear wings are from aluminium, but in order to achieve a 50/50% weight distribution, the boot lid and rear floor are actually made from steel. 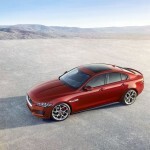 Jaguar said that XE is the lightest, stiffest and most aerodynamic Jaguar saloon ever built. 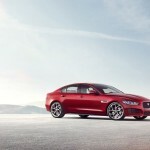 First technical data announce a kerb weight for XE S version of only 1,474 kg. A Mercedes C 250 with 4 cylinder engine weighs 1480 kg (there are still no data for the new C 400) meanwhile BMW 335i with 6 in line has 1,585 kg, which means 111 kg more than Jag. 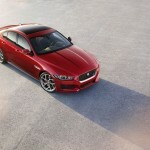 And with 5.1 sec from 0 to 100 km/h (0-60 mph in 4.9 sec), XE S is 0.4 sec faster than BMW 335i. 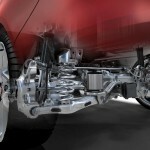 Jaguar emphasise that “where the most competitors use MacPherson strut front suspension, Jaguar vehicle dynamics team insisted on the superior double wishbone configuration”. But Mercedes is not part of these “most of the competitors” and the new 4-link axle that we already tested on C-Class offers a highly improved dynamics and reduce understeering. 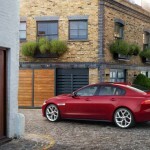 For the first time in a Jaguar, the steering is electric and regarding rear suspension Jaguar speaks about an Integral Link and not a multi-link solution. The All Surface Progress Control (ASPC) is also new, a system which works between 3.6 and 30 km/h and delivers optimum traction in the most slippery conditions without skidding and without using the pedals. 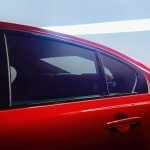 Jaguar also claims that the new head-up display offers instructions with maximum clarity and the laser HUD is smaller and almost a third lighter than the existing systems. V6 engine is for the moment the top of the range, but more interesting for the customers are the smaller engines. 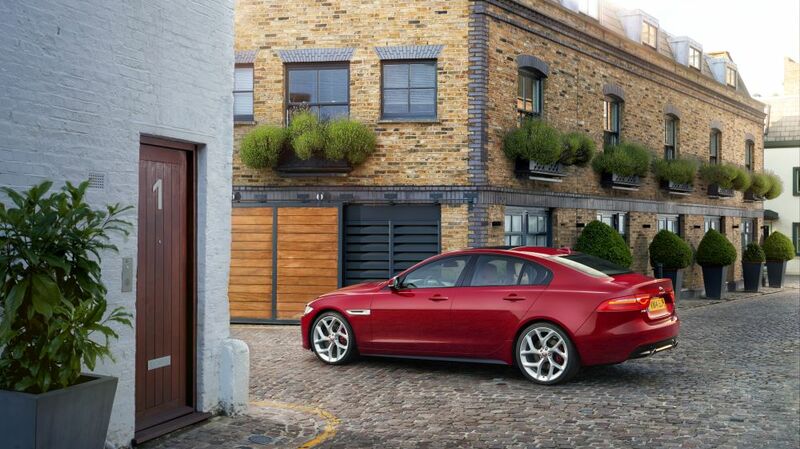 Here Jaguar work intensively to the new Ingenium generation of engines. 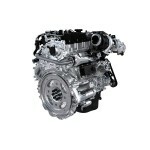 These is a range of engines with a cylinder capacity of 500 cmc, a similar strategy with BMW. The first member of the new family will be a Euro 6 2,0 litre diesel with 163 HP and 380 Nm which promises a fuel consumption of 75 mpg and only 99 g/km CO2 emissions for the version mated with a 6-speed manual gearbox and start/stop system. 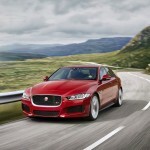 Later will follow twin-turbo diesel and petrol versions also with 2 litre. 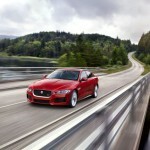 A 6 cylinder is in plan but Jaguar has not decided yet the configuration. 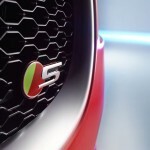 They have to choose between 6 in-line and V6 (Mercedes will also pass to 6 in-line for the next engine generation). 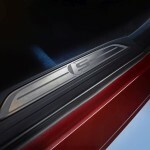 Full details of XE will be announced at Paris Motorshow at the beginning of October.